First, a recap. Last year, Raj Rajaratnam, Sri Lankan-born hedge fund manager, was sentenced to 11 years in prison in the biggest insider-trading case in US history. Many of his associates are also serving time. 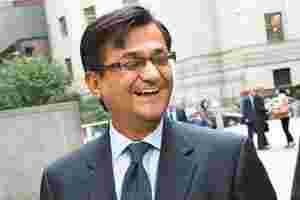 Rajat Gupta, former head of McKinsey, has been convicted. He awaits sentencing. The key government witness in the Rajaratnam case was Anil Kumar, former McKinsey executive, who sold inside information to Rajaratnam for years. Kumar also testified against Gupta, who had been his long-time mentor and friend. The prosecutors have kept their part of the deal they made with the man who agreed to rat on everyone. I have with me the 72-page “sentencing memorandum" submitted by Kumar’s lawyers to Judge Denny Chin, pleading for a lenient sentence. This document is the biography of a saint who, right from childhood, beat seemingly insurmountable odds, sacrificed his own happiness for the greater good, and devoted his life to philanthropy. But any intelligent Indian reading the document can have either of only two reactions: a hearty laugh, or lock-jawed amazement at the sheer misinformation and hypocrisy. Kumar’s account of his childhood makes David Copperfield look like Richie Rich. His father worked in Shell India. In 1970, when the family found itself in Goa, “an underdeveloped former Portuguese colony", as the document refers to it, the 10-year-old Kumar “persuaded his parents to let him apply for one of only a few openings available for gifted children at Doon School". The boy’s only contact with his family in the five years he spent at Doon was through mail. “The school was so far from his parents’ home" that his father visited him only once, and his mother never. This sounds strange. The family of an employee of a multinational company could not afford to visit their son for five years, nor have him over on vacations? Surely, Kumar’s father’s job benefits included leave travel allowance? But when Kumar could not manage a scholarship for his Masters in Business Administration at Wharton, “Anil’s family loaned him some initial tuition money." Yes, that same impoverished family. And one can be sure that if his mother had sold her wedding jewellery to lend him the money, Kumar’s lawyers would have waxed eloquent on that. As a student at the Indian Institute of Technology (IIT), Bombay, “Anil recognized that energy would be a major concern for the planet and society needed to explore alternative means of providing energy... Anil aspired to do his share by…researching energy conservation during his senior years." Any IITian knows that this merely means that he did his final year project on solar power. He fell in love. “Malvika studied in Bombay, 30 miles away from IIT. These 30 miles, which took Anil over two hours by bus, train and another bus, could not prevent Anil from trekking to Bombay to be with Malvika every weekend." This heroic voyage of love has, of course, been undertaken by thousands of Bombayites every day for decades. Besides, even if Malvika lived at the southern tip of Bombay, the distance from IIT would be 20 miles, not 30. That 50% error could have cost a McKinsey executive his job. Kumar’s son Aman is a person with special needs. The document, as released by the US government, has chunks of it blacked out to protect Aman’s privacy. But the very length of the censored sections (nearly 15% of the document) proves that Kumar used his son’s condition to the hilt to plead for leniency. I find this vaguely distasteful. A comparison is perhaps unfair, but Robert Moffat, an IBM executive convicted in the same case, did not ask for leniency citing his wife’s multiple sclerosis. The document claims that Kumar was repeatedly treated unfairly by McKinsey, which directly resulted in him being vulnerable enough to be manipulated by Rajaratnam (Yes, it was all McKinsey’s fault). It provides an alarmingly long list of Kumar’s philanthropic activities. Except that a few of the initiatives Kumar takes credit for were Gupta’s projects, and Kumar only handled operational details. And later, the authors let slip that Kumar was getting paid for some of his “contributions to India". Oops. However, the most interesting argument that Kumar’s lawyers make is that his going to prison would “harm" India. Describing India as an “unforgiving" society, the document quotes a friend: “Incarceration will make it considerably more difficult, if not impossible, for Anil to continue pursuing (his) initiatives… Indian culture tends to ostracize individuals sentenced to prison." But the document also admits that “in the US, Anil is regarded as so toxic that most companies and even non-profit institutions will not associate with him." This, when Kumar hadn’t even been sentenced. And he has the gall to suggest that Indians have a “cultural" problem with jailbirds. The memorandum also reveals that “the vast majority of work, both paying and charitable, that Kumar has been able to obtain (post-arrest) is in India." So, Kumar must be kept out of prison for the sake of those ungrateful merciless Indians. And because Indians are the only ones who will pay for his services anymore. Who knows, Judge Chin may really want to see a vibrant prosperous India. And how would we manage that without Kumar? Sandipan Deb is a senior journalist and editor who is interested in puzzles of all forms. He is currently working on a book on Rajat Gupta.